I have finally persuaded my wife to take up cycling. I have been off to Halfords and bought her a new bike. Both of our bikes fit into my discovery 2 but I have to take the front wheels off. Bit of a faff and no room for the kids bikes. Whilst in Halfords I saw a bike rack that fits on the tow bar for about £70. On E bay there seems to be a rack that fits onto the spare wheel carrier. It costs about the same. My question is which one should I go for? Or is there another option? Thanks a lot for any ideas you might have. I have both types and would recommend the wheel carrier mounted one. Both have the issue of obscuring your rear lights and number plate though. The main thing is that the wheel mount one is a solid (shaped) tube, very strong. I've had the Halfords wheel mounted one bought from ebay for a fiver around 5 years ago. It's survived several trips to France carrying 2 mountain bikes. It does wobble a bit but has never shown any signs of dropping off. 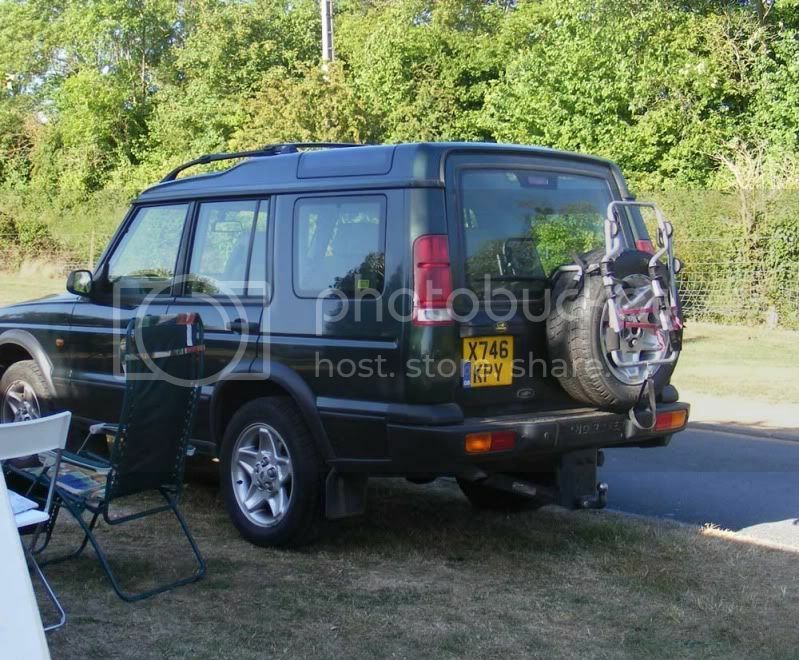 The main advantage over the towbar versions is that you can still (carefully if the bikes are on) open the tailgate. We also tow a caravan with the bikes mounted and never had a problem with them fouling, which I was a bit concerned about before using the rack. It folds down when the bikes aren't on and is very easy to mount / dismount although I always check & retighten the straps after a few miles as they can get a bit loose at first. I was tending towards the spare wheel type rather than the tow bar type, as this would allow me to open the tailgate without removing everything. Any ideas what would be the best method of making sure the bikes stay on the rack? would bungee cords be enough? They normally come with built in straps/rubber clasps. I'm currently considering this as an option http://www.bak-rak.com/uni-rak.htm and fabricating my own add ons, or maybe this http://www.bak-rak.com/pole-rak.htm. I need something that is flexible and could be used as a ski / bike / storage rack and I don't mind doing a bit of fabrication. The one I have has little velcro straps that hold the top tubes of the bikes in place, although I also use straps to pull the bottoms of the bikes in towards the wheel. Those (otherwise useless) belts you get with craghopper trousers are ideal! I'd be careful about a spare-wheel mounted one and opening the rear door, it's quite a lot of extra weight/leverage on the hinges. We've had a Pendle one that mounts using the towbar bolts. It must be 15 years old and has been on countless cars, it was bought originally for a TD5 discovery but fits on the 110. It's quick to put on and very strong, the downside is that it has to come off to open the rear door. I must say I've always been slightly worried about the 4 10mm(?) bolts holding the spare wheel carrier to the door however.